There is much more to mud than mud masks and mud castles. Mud can provide researchers with information about past climate. With only a few decades of direct observational data, knowledge of the past climate is our only way to understand change beyond a few decades. Mud from the depth of the ocean provides researchers with a time record of our past climate system because it contains the remains of small shelled organisms called foraminifera. These (beautiful!) organisms archive information about their living environment in their shells. So, how can we infer information about the past climate from foraminiferal shells in the mud? Researchers take sediment cores at large depths in the ocean and measure, amongst other things, the different isotopes of the element carbon in foraminiferal shells. The most common isotope 12C (making up 99% of all carbon on earth) and the less common 13C (~1% of all carbon) together can give researchers information about many components of the past carbon cycle and therefore the past climate. These components include atmospheric CO2, the amount of plants on land, the impact of marine biological activity on the carbon cycle, and the extent to which carbon was stored in the deep ocean. Untangling this information from the mud is, as you might suspect, not easy. 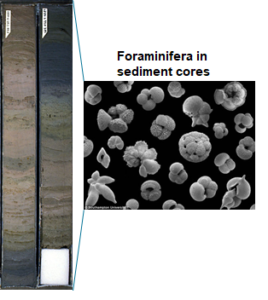 Example of a sediment core and what foraminiferal shells look like. Figures adjusted from Paul Pearson and Hannes Grobe. This is where my field of research comes in*. One way to untangle the story of the mud is namely to simulate the past ocean using computer models. They give us the freedom to change any process we like so that we can explore the potential effects of such a process on the system. In doing so, we often succeed in untangling the long list of components that influence the system – and, more importantly, we figure out how it works. Using an ocean model with the element carbon (and its isotopes) in it, I studied the role of the Southern Ocean in the 12C-13C distribution. I recently understood that the interpretation of the 12C-13C ‘duo’ in the mud can only be made if we have knowledge about the state of several processes in my study area, the Southern Ocean. This large ocean around Antarctica is a region where the interaction between ocean circulation and biological processes creates a unique and very complex environment, important for the global carbon cycle. Thus, unless we understand the state of the Southern Ocean, it is complicated to interpret the carbon isotopes in the mud. Without that information, understanding the drivers and sensitivities of the past climate gets more complicated – as well as understanding the implications of this past for our current climate. So next time you look at mud, think about the story it might contain about the past! * You can find the open-access article here. 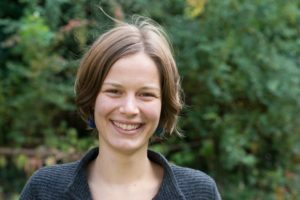 Hei, I am Anne, a Dutch PhD at the Geophysical Institute in Bergen, Norway. My PhD research is about chemical oceanography, more precisely about ´the role of the Southern Ocean in global carbon cycling´. Don't hesitate to contact me if you have a suggestion to improve my writing! Tagged carbon isotopes, climate PhD, oceanography, publication.